Brings the family together in new ways! The Wii U is a revolutionary entertainment system that gives you an exciting new way to play! The GamePad, an innovative 6.2 inch touch screen, re-defines the way you and your family game, connect and enjoy entertainment together. This console combines dynamic game-play with full HD graphics for a truly superior gaming experience. 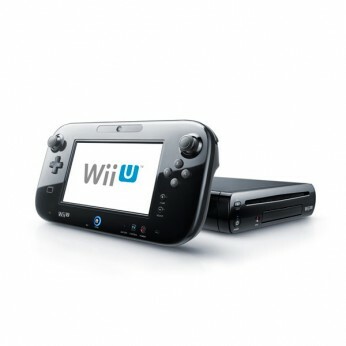 The Wii U Gamepad controller removes the traditional barriers between games, players and tv by creating a 2nd window into the video game world and can also function as an infared TV remote whether users are watching TV or playing a game. Adding in a second screen to the living room creates a multitude of new video game experiences. The premium pack includes Nintendo Land, a fun and lively theme park game filled with 12 different attractions. Based on your favourite Nintendo franchises these mini-games show off the incredible versatility of the Wii U console. Includes Wii U console, Wii U GamePad, GamePad cradle, GamePad stand, Wii U console stand, Sensor bar, GamePad AC adaptor, Wii U console AC adaptor, HDMI cable and Nintendo Wii U game. For ages 3 years and over; EAN/MPN/UPC/ISBN: 45496311056. This toy costs approximately £249.99 (for the latest and best prices make sure you check our retailer list for the Wii U Console : Black Premium Pack + Nintendoland above). In our review of Wii U Console : Black Premium Pack + Nintendoland we classed it as being suitable for ages 4 years, 5 years, 6 years, 7 years, 8 years, 9 years, over 10 years, Teenagers but recommend you check the manufacturer specific advice before purchasing.